Herb Chicken is on the menu at the Community Supper on April 25 at the United Methodist Parish Hall. Come at 6 p.m. and enjoy the free meal with your friends and neighbors. Donations are gratefully accepted and used toward the cost of future suppers. Chichester Grange will hold its annual Awards Night on Wednesday, May 2, at 7 p.m. in the Grange Hall. A Community Citizen, a Fire Fighter, an Educator, a Postal Worker, an Outstanding Youth, and a Local Business will be recognized. Refreshments will follow the presentations. Happy Birthday to Chris Millette on April 29, Joshua Stone on April 30, and Timothy Harris on May 1. It seems to have come very fast this month. Tomorrow, April 26th, is the last Thursday of the month.Therefore, 1/2 price day! Help us clear out winter clothing (don’t forget socks, jackets, sweaters) and bargain prices. We are on Rte. 28, 345 Suncook Valley Hgwy, Chichester. Open Mon. 8-12; Tues. & Thurs 8-4; Wed. 11-4 & Sat. 10-4. 247-7191. Cash & Check only, no credit cards. We accept small household items and clothes. No furniture or computer equipment, and please do not leave anything outside when we are not open. Rain damage just gets your donations a trip to the dump. School Vacation is this week. Looking for something for the kids to do? Tonight, at 6 p.m., there will be a Movie Night. “Ferdinand,” all about a very big bull with a very big heart is the selection. Fresh popped popcorn will also be available. Although there is no Pre-school Story Hour tomorrow, there is Lego Time at 10:30 a.m. for those interested. Only their imagination is the limiting factor when working with Legos. And, the library has a couple of Fun Passes, which can be used for reduced entrance fees to various activities in the New England area. Please note on your calendar that the May Down Under Used Book Sale is scheduled for Saturday, May 5th, from 8 a.m.- 1 p.m. This is also the annual plant sale. As a reminder to all, the Down Under Used Book area is closed to the public on Thursday and Friday prior to the book sales. In addition, the area is closed during scheduled programs, meetings or events as a courtesy to those using the community room. And, last but not least, there was a huge turnout for last week’s vibraphone concert with Rich Araldi. There were over fifty in attendance. Multigenerational families were there, along with neighbors and relatives who haven’t seen each other throughout the winter season. Mr. Araldi presented us with wonderful music and entertainment. Thanks to all for coming! Chichester poet Jimmy Pappas’s poem, “Bobby’s Story,” was the winner of the Readers Choice Award in the prestigious poetry journal Rattle. “Bobby’s Story” was one of ten finalists selected by the editors out of a total of over 15,000 submitted poems. The subscribers then voted for their favorite and selected Jimmy’s poem as the winner, a great honor in the world of poetry. Jimmy’s work describes significant experiences in the life of a Vietnam veteran named Bobby, using his own words and the words of several other veterans. You can read the poem and listen to an audio of Jimmy reciting it by going online to www.rattle.com/bobbys-story-by-jimmy-pappas. Jimmy promised Bobby before he died that he would make him famous in a poem. Now Jimmy hopes that readers will pass the link on to other people around the world. They can learn about what Bobby went through in his life and see him as a heroic but flawed human being. Jimmy’s love of poetry is well-known in the state, as he participates in the Poetry Society of New Hampshire and also facilitates the “Down Cellar Poetry Group” of the Chichester Town Library. The Poetry Group meets the first Monday of the month, at the library. Our congratulations are extended to Jimmy. 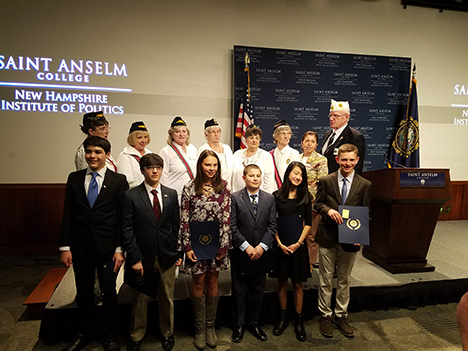 1: David Testerman (front row, far right), with other competitors and representatives of the American Legion and American Legion Auxiliary, at the New Hampshire Junior Oratorical Contest at Saint Anselm’s College. 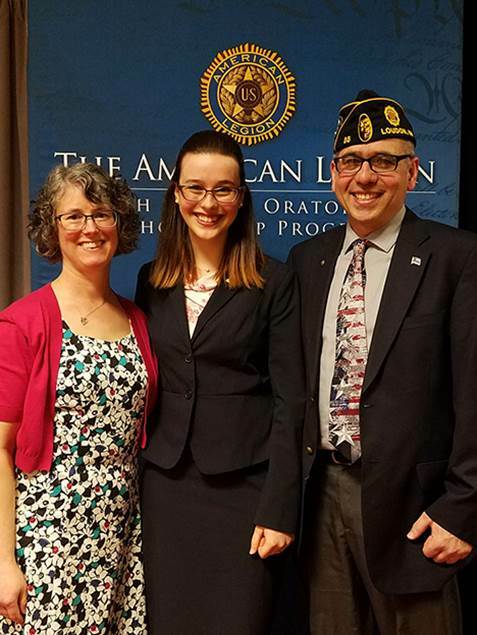 ​Hana Testerman (center), with her parents, Martha and Patrick Testerman, at the American Legion National Oratorical Contest in Indianapolis. Hana Testerman of Chichester recently competed at the American Legion National Oratorical Contest in Indianapolis, IN. As the New Hampshire champion, she joined 52 other competitors representing every state, the District of Columbia, Puerto Rico, and France. The contest exists to develop deeper knowledge and appreciation for the U.S. Constitution among high school students. Since 1938, the program has presented participants with an academic speaking challenge that teaches important leadership qualities, the history of our nation’s laws, the ability to think and speak clearly, and an understanding of the duties, responsibilities, rights and privileges of American citizenship. Following in his sister’s footsteps, David Testerman competed this year in New Hampshire’s Junior Oratorical Contest, the only one of its kind in the nation. The contest is open to middle school students and is modeled after the national competition. After winning his district-level contest earlier in the year, he won second place at the statewide contest held at Saint Anselm’s College earlier this month. He hopes to compete next year at the high school level. Mrs Bush visits Chichester Central School 1991. Sabrinna, President Bush, Teresa, and Mrs. Bush 1991. 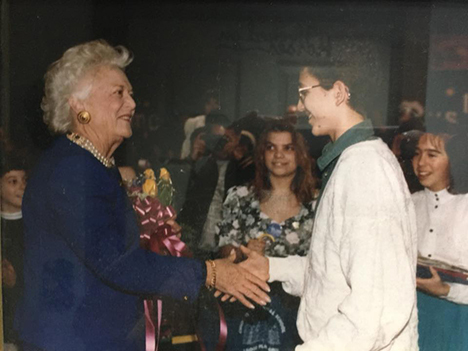 GREAT MEMORIES: In the early 90’s I had done work with the advance team under the direction of Governor Hugh Gregg, working beside Secret Service for President Bush, first lady Mrs.Bush and V.P. Dan and Marilyn Quayle. One day Gov. 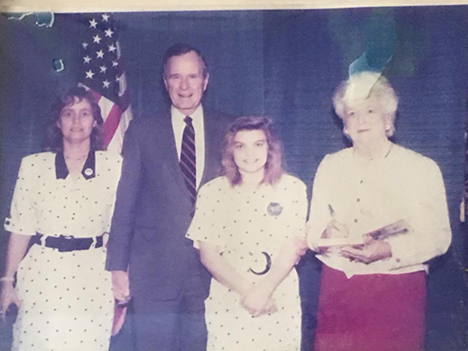 Hugh Gregg called me and asked if I would like to do something with first lady, Mrs. Bush and I chose to bring her to our school, Chichester Central School, in Chichester NH where my daughter Sabrina was in 7th grade. To set up the visit; I called the Principal at Chichester school to ask if he would like the first lady, Mrs. Bush to come for a visit ? I said, Mr. Armstong, this is Teresa and I was wondering if you would like First Lady Mrs. Bush to come for a visit to Chichester School ? The phone was silent for a few moments and than he asked, UM when, and I went on to say, how about next Tuesday at 2 pm, Once again the phone went silent for a few moments!!! What an enjoyable moment to have First Lady Mrs. Bush as a part of our School and our town..... I also set Mrs.Bush up for a media interview with owners Tony and Steve, at our favorite pizza restaurant in Epsom. Great memories working with all these great and wonderful people. Rest in Peace with many Blessings Mrs. Bush, you had a hand in making a difference for so many people.